(Phys.org) —Rows of aluminum studs help solar panels extract more energy from sunlight than those with flat surfaces. In new research, scientists have demonstrated that the efficiency of all solar panel designs could be improved by up to 22 per cent by covering their surface with aluminum studs that bend and trap light inside the absorbing layer. At the microscopic level, the studs make the solar panels look similar to the interlocking LEGO building bricks played with by children across the world. "In recent years both the efficiency and cost of commercial solar panels have improved but they remain expensive compared to fossil fuels. As the absorbing material alone can make up half the cost of a solar panel our aim has been to reduce to a minimum the amount that is needed," said lead author Dr Nicholas Hylton from the Department of Physics at Imperial College London. "The success of our technology, in combination with modern anti-reflection coatings, will take us a long way down the path towards highly efficient and thin solar cells that could be available at a competitive price." Dr Hylton and his colleagues attached rows of aluminum cylinders just 100 nanometres across to the top of the solar panel, where they interact with passing light, causing individual light rays to change course. More energy is extracted from the light as the rays become effectively trapped inside the solar panel and travel for longer distances through its absorbing layer. "The key to understanding these new results is in the way the internal structures of these metals interact with light. Gold and silver both have a strong effect on passing light rays, which can penetrate into the tiny studs and be absorbed, whereas aluminum has a different interaction and merely bends and scatters light as it travels past them into the solar cells." An additional advantage to this solution is that aluminum is cheaper and far more abundant than silver and gold. 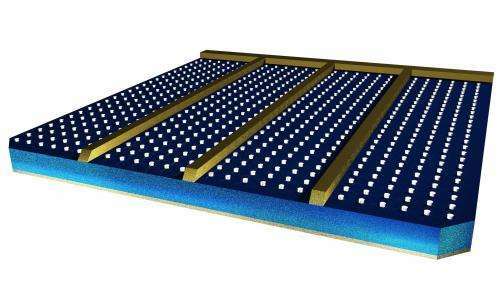 Increasing the surface area of the solar cell without increasing the area of the cell's footprint will increase the energy output per square centimeter. The upper surface of an airplane's wing is curved while the lower surface is flat in order to accomplish lift. The same volume of air passing over the larger surface area of the upper surface creates a low pressure zone above the wing relative to the lower surface, providing lift. Bernoulli principle. Light striking a larger surface area for a given footprint will naturally produce more energy. In this case, there is more light made available for energy conversion through refection and scattering. Etching or stamping conically shaped holes in the silicon would have a similar effect. As the light ray enters the silicon from a low refractive index hole it bends towards the normal and stays in the active layer longer. especially if the rear has a reflective coating or the newly diffracted ray angle to upper surface causes total internal reflection. Wrong. Solar constant is a constant. What you propose will actually DECREASE the energy output per square centimeter. The upper surface of an airplane's wing is curved while the lower surface is flat in order to accomplish lift. Light striking a larger surface area for a given footprint will naturally produce more energy. Wrong. Intensity will decrease while area illuminated will increase. The energy is the product of the two and stays exactly the same.